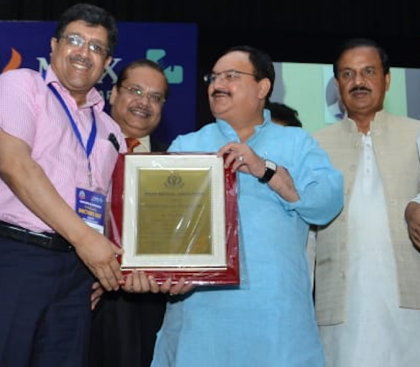 New Delhi: Doctors Day celebration in the capital saw, the Union health Minister honouring and facilitating many leading medical professionals for their distinguished work in the profession and contribution to the society. At a glittering function held at Maulana Azad Medical College, the event saw participation form Union Minister of Culture, Dr Mahesh Sharma and Host of medical luminaries across the capital and country. Speaking on the occasion, Dr. Ashwani Goyal, President, DMA said that our doctors are making the nation proud with their outstanding and dedicated medical services as India is becoming the hub of medical excellence for the nation and whole world. He complimented the doctors for their academic achievements in the medical field alongwith their zeal to serve the humanity and in the various programmes of the government. Congratulations to Dr.Vijay Trihan for his outstanding contributions in Medical Services. No award to any doctor outside North India? Looks like damage control after all the disparaging remarks made by the PM about medical professionals, keeping in mind the 2019 elections. Are we fools? Congratulations to all who received the award. Why majority of cardiologists get this kind of award? because they have the money to pay for these awards!!! Whole heartfelt congratulations to the central Govt.At state level mostly it was misused.Appreciate acceptance ofDoctors Services at least asVidushak in Royal Office.